The Environ Original range is a series of products that provides a complete skin care programme. The moisturisers contain Vitamin A and essential anti-oxidants, Vitamin E and C as well as beta-carotene. 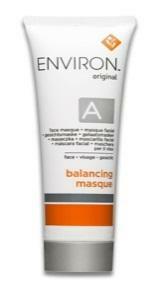 The concentration of Vitamin A increases in a step-up system of the moisturisers. Consumers are advised to follow the step-up system. 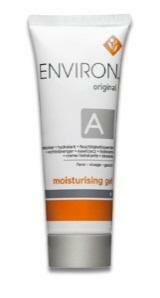 Environ’s Original Gentle Cream Cleanser is a gentle, light, non-sensitising, water soluble, soap free cleanser. This product is preservative and fragrance free. 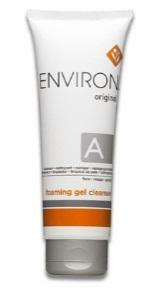 Environ’s Original Foaming Gel Cleanser is a mild, foaming face and body wash. This product is preservative and fragrance free. This Pre-Cleanser has been designed for people, with dry sensitive skins to assist in pre-cleansing and moisturising the skin. It assists in removing excess oil and debris and is an effective make-up remover. 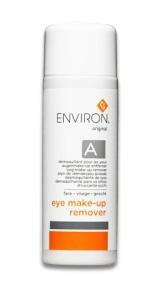 Environ’s Original Eye Make-up Remover is an oil-free, non-irritating eye make-up remover. It gently removes eye make-up without drying the skin around the eye. This product does contain a preservative or a fragrance. Contains Honeybush Tea extract for its powerful antioxidant and soothing properties. 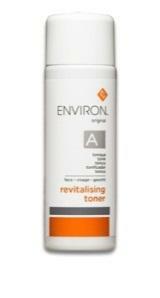 Environ’s Revitalising Toner helps to remove residual cleanser and/or make-up. Encourages exfoliation in the gentlest way possible. Helps to minimise bacterial growth. Environ’s Original Balancing Masque is a masque specifically designed to improve hydration and simultaneously remove excess oils from the surface of the skin. This product is fragrance free. Environ’s Original Debut is an introductory moisturiser of the step-up system containing the lowest concentration of vitamins A and C. Suitable for all skin types including young and sensitive skin. 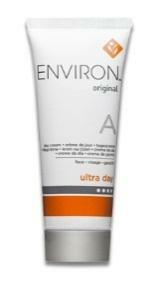 Environ’s Original Moisturising Gel is a mild gel- based moisturiser containing antioxidants and a low concentration of vitamin A and vitamin C for hyper-sensitive, congested, oily or reactive skins. Environ’s Original Mild Day moisturiser contains a mild concentration of vitamins A & C, antioxidants and complements the Original Mild Night moisturiser. Environ’s Original Mild Night moisturiser contains a mild concentration of vitamins A & C, antioxidants and complements the Original Mild Day moisturiser. 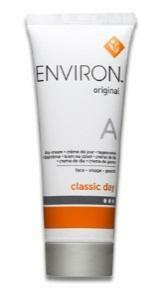 Environ’s Original Classic Day moisturiser contains a medium concentration of vitamins A & C, antioxidants and complements the Original Classic Night moisturiser. Environ’s Original Classic Night moisturiser contains a medium concentration of vitamins A & C, antioxidants and complements the Original Classic Day moisturiser. 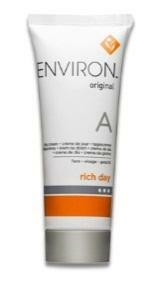 Environ’s Original Rich Day moisturiser contains a medium concentration of vitamins A & C, antioxidants and complements the Original Rich Night moisturiser. 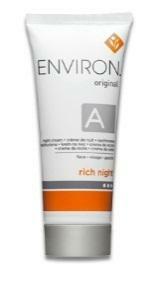 Environ’s Original Rich Night moisturiser contains a medium concentration of vitamins A & C, antioxidants and complements the Original Rich Day moisturiser. 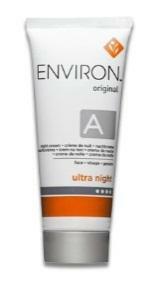 Environ’s Original Ultra Night moisturiser contains the highest concentration of vitamin A and C in the Original range and complements the Original Ultra Day moisturiser.